What with global warming and all, I figure we still have at least six more weeks of beach weather. So yes, it’s a bit later than normal, but here’s my summer reading list. It’s a bit short, I know. 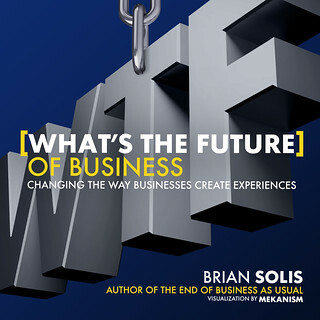 But frankly there is only one business book that I’d want to read at the beach and that is Brian Solis’ What’s the future of business? Changing the way businesses create experiences. If you want mindless pap on your vacation, do not bring this book. This is a book that is designed to make you think. I love anything that Brian writes, but this book is a real gem. First of all layout and the design make it a joy to read (Note to self: get Mekanism to design my next book.) The design isn’t just innovative, but it does make every chapter a bit more compelling. Brian’s premise is thisL In this hyper-connected world, the customer experience isn’t just a big deal, it is the only deal. Everything begins and ends with a customer experience. The better the experience, the more personal connection the more likely that it is share-worthy. The companies that get this concept are the ones that succeed. The ones that do not will join the burgeoning ranks of companies that were on the Fortune 500 20 years ago, but don’t even exist today. Brian’s message to marketers is a stark one – adapt or die. (actually sounds a lot like Bob Garfields, now that I put it that way.) The future of the company is not in how well they get their messages across but in what the customers say about them. He essentially thrusts a great big stake in the heart of the traditional marketing funnel (awareness, interest, decision and action.) He replaces it with what he believes is far more important, the various moments of truth – from that first touch point that a business has with its customers to thru what the relationship that may or may not develop from that first moment.And, while this book is very much focused on traditional B2B and B2C businesses, I would argue that his philosophy is just as applicable to the non—profit world. The quotes alone are worth the price of the book – From a Hugh MacLeod cartoon “Engagement is not something you do, engagement is a way of life." Even bettter: "Social Media is more about social Science than technology" -- The Millenial generation totally gets this, but the rest of us seem to still think that this is all about the technology. It isn't. It's about human relationships and the communities to which we belong. I also like his concept of social architecture – the ART of engagement – where actions reactions and transactions become the fabric of he customer experience. And yes, there is a measurement angle.. Chapter 15 is all about the metrics that companies use to make decisions.. My favorite statistics in the book? IBM Found that CMOs who use customer data to improve customer sexperiences are outperforming those that do not make similar investment. The ultimate message of WTF is that saying that you are “Customer Centric” isn’t enough. You must bring together the customer and his/her community with your entire company, the designers, the customer service reps, the sales & marketing team, HR -- all of it -- if you want to impact the experience that the community has with your company and/or brand. It’s not a revolutionary thought. Many of us have been preaching this for a number of years. But Solis has put it into a compelling and convincing book that should finally win over the naysayers. And you know what. Those who aren’t persuaded, probably won’t be around to bother us for much longer.